Lifi Internet connectivity is a disruptive technology making use of the visible light spectrum near ultra violet to transmit data at speeds of over 100 times the speed of WiFi. Speeds of up to 10GBps (10 Gigabit per second) have been achieved. 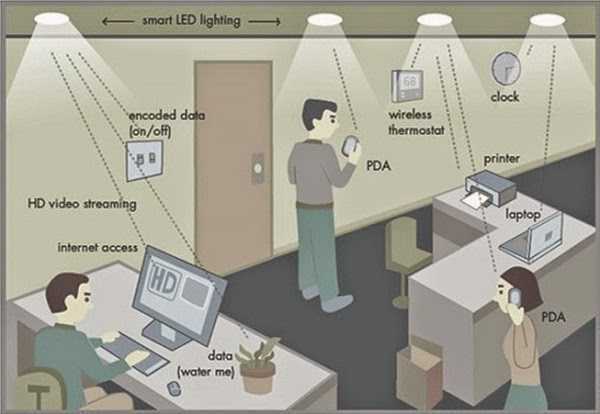 LiFi has the ability to effectively turn every LED light bulb into a wireless internet hotspot! What is the difference between LiFi and WiFi? : Wifi uses radio waves to transmit data whereas LiFi uses the visible light spectrum. Internet Connectivity enabling both voice and data communication. Replacing old lights with LED lighting has been a fairly expensive exercise for companies wishing to reduce their energy consumption and carbon footprint. Of course the investment in LED lighting has shown to be a significant cost saving exercise and companies will recover the capital expenditure in the form of savings. With the advenbt of LiFi, Companies are able to improve their communication and data networks as well as lower their electricity consumption and carbon footprint. With the opportunity to ramp up internet connectivity speeds as well as save on electricity consumption we are expecting to see a very signficant uptick in the numbers of companies inquiring about LiFi capable LED lighting infrastrructure. Wifi uses an enormous amount of energy to run the base stations to provide the radio waves necessary for WiFi connectivity. Ironically, most of the energy is used to keep the base stations cool. LiFi uses the visible light spectrum which is far more efficient and there is already an existing lighting infrastructure with at least 14 Billion light bulbs in operation. Currently most lights are incandescent bulbs which make use of large amounts of energy to produce light and by simply replacing these with LED bulbs will provide the network required to run LiFi. By changing your lighting infrastructure to LED lighting you are effectively enabling your lighting network to carry and transmit data. The three different types of Internet connectivity, wired, wireless and now LiFi will complement each other moving into the future. Each has it’s own set of positive and negative traits, LiFi simply adds an additional layer providing super high speed and super capacity data transfer to the Internet Connectivity offerings. In the age of Big Data, capacity and speed are becoming more and more important and LiFi offers a solution to transmitting huge amounts data very fast. An interesting discovery by app developers was a “LiFi capable” piece of code for developers indicating that Apple is experimenting with making Iphones LiFi capable. If we consider that every phone has a LED light on it, this could revolutionise mobile computing with ultra high speed LiFi connectivity. At this point LiFi connectivity is not available when we are outside in the sunlight, we need to be in line of sight of a LED lamp which further shows that LiFi and WiFi will likely work hand in hand in the future and LiFi will not replace WiFi as a connectivity option.